In our criminal justice system, detainers to hold individuals wanted by law enforcement agencies are issued by judges after they have reviewed the underlying circumstances leading to the request. Immigration detainers, or “ICE holds” are issued by ICE administrative officials without the benefit of judicial review. In this preliminary report, based on data from the Los Angeles Sheriff's Department, Justice Strategies finds that the cost to Los Angeles of complying with these administrative requests is more than $26 million annually. Los Angeles County is spending an estimated $26 million a year to hold undocumented immigrants under the Secure Communities program, according to a report released Thursday by Justice Strategies. Secure Communities, also known as S-Comm, checks the legal status of anyone booked into a local jail and transfers those who are undocumented to ICE custody. Los Angeles County taxpayers spend over $26 million per year to detain immigrants for ICE. Individuals in Los Angeles County custody who are subject to immigration detainers spend, on average, 20.6 extra days in county custody. California taxpayers spend an estimated $65 million annually to detain immigrants for ICE. Based on L.A. County averages the report concludes S-Comm is costing the state an estimated $65 million. A new report finds that Los Angeles County spends $26 million a year to detain undocumented immigrants for the federal Secure Communities program. Here’s how Secure Communities works: When local law enforcement makes any arrest, the detainees' fingerprints are sent to a federal database. If the person is deportable, Immigration and Customs Enforcement (ICE) will ask local law enforcement to keep the person in detention for no more than 48 hours, until federal agents can transfer that person to one of its facilities. WASHINGTON -- Los Angeles County is spending more than $26 million a year to hold undocumented immigrants under a federal immigration enforcement initiative, individuals it would otherwise release, according to a report on Thursday. Critics say that demonstrates the high cost of the program, in which some local governments would rather not participate. 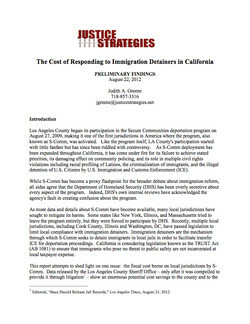 The report by Justice Strategies found that the cost of Secure Communities, a cooperative program between local police and Immigration and Customs Enforcement, is steep mainly because jails hold suspected undocumented immigrants are held an average of 20 days longer at ICE's request than they otherwise would. The advocacy group examined public records from the Los Angeles County Sheriff's Department provided to the National Day Laborer Organizing Network. Los Angeles County Sheriff Lee Baca is among the California law enforcement officials who may defy a proposed state law and continue to detain arrestees who are illegal immigrants when asked to do so by federal authorities.